A humanitarian ship carrying 64 migrants is stuck in the Mediterranean Sea after both Malta and Italy refused them entry, setting the scene for another standoff between EU member states. The migrants were rescued off the coast of Libya on Wednesday by the German NGO, Sea-Eye. The aid group said it was looking for another ship that had gone missing on Monday with 51 migrants on board when it received the distress call. It accuses the Libyan Coast Guard of ignoring its attempts to get in contact. "Some politicians like to describe charities like us as not cooperating with the authorities. But the fact is that in Tripoli no one was available under eight different phone numbers and the emails were not answered," Gorden Isler, spokesman for Sea-Eye, said in a statement. "How should one cooperate with someone who does not communicate?" he added. One young child, a baby and a pregnant woman are among the 64 people rescued, who originate from six countries, although most come from Nigeria. Strong winds have forced the captain of Sea-Eye's 'Alan Kurdi' ship — named after the Syrian boy whose washed-up body pictured in 2015 moved the world — to have as many migrants move below deck as possible where they are in cramped conditions. The ship is currently in international waters off the Italian island of Lampedusa, where it will remain until a solution is found, a spokesperson told Euronews. Sea-Eye has requested support from the German Federal Foreign Office to find a diplomatic solution. Both Malta and Italy have refused entry. In a tweet on Wednesday, Italian Interior Minister Matteo Salvini said that as the ship is German-registered, it should "go to Hamburg." Similar standoffs in the past have been resolved between EU member states after days of negotiations. 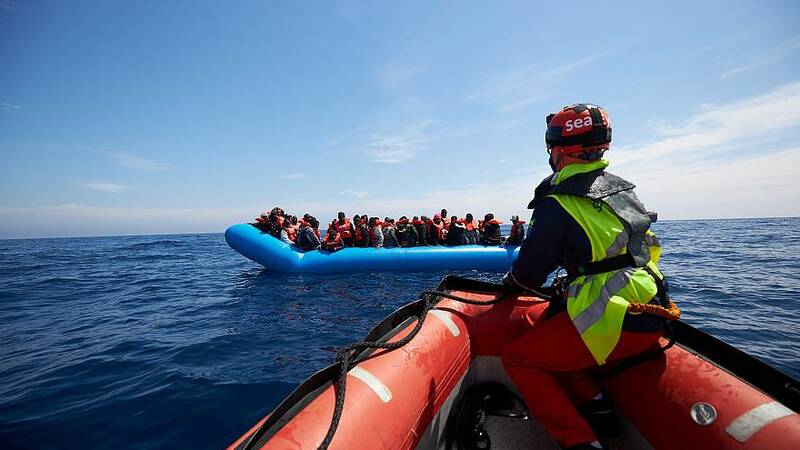 A Spanish-rescue vessel with 11 rescued migrants on board was eventually allowed entry to Malta in December 2018 after nine days at sea. Another 141 migrants were stranded on the Aquarius for four days last August before being allowed to dock in Malta after a deal was reached between different countries.